This past Shabbos, we read about the mitzva of chalitza. Briefly, when a married man dies childless, the widow can automatically become the wife of her husband's brother to carry on her husband's lineage. Since they aren't yet married, there is no requirement for a divorce – but, should they decide not to pursue this union, their relationship can be terminated through chalitza and they can each go their own separate way. 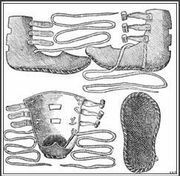 The chalitza process involves the woman unwrapping a special boot with leather straps that go up the leg of the man. In Sefer Bereishis when Avraham Avinu defeated the five kings, Avraham was offered the spoils of war by the King of Sodom. Avraham, though, rejected the offer and instead said, "Not even one shoe-strap will I take." That is to say: Wealth and power are not the focus of life - you keep it; you are concerned with things like power and money. They are your gods. My G-d will send me all the wealth I need. Avraham merely requests the lives of his family members, and to recover what was invested in the battle. Chazal tell us that in the merit of the leather "straps" that Avraham refused to take, Avraham merited the mitzvos of tefillin straps and chalitza straps. But, what is the connection? Another question: When Shlomo HaMelech ruled the Jewish nation, there was an individual, a leader, named Yeravam who was morid bemalchus (rebel against the kingdom). His rebellion was considered to be a crime punishable by death and Yeravam was forced to flee – only to return after Shlomo's passing, when he famously wrested power from the Kingdom of Yehuda, splitting the nation in two and forming the Malchus Yisroel. We are told that he was morid bemalchus by removing his tefillin in the king's presence. But, what is so terrible about that? Is that so disrespectful to deserve death? The answer lies in the fact that tefillin are really about freedom. A slave does not wear tefillin, only a free man can. This ties in with an interesting halacha that forbids someone to perform a demeaning task, such as tying his teacher's shoe laces, because this is considered lowly and tantamount to being enslaved. Since we belong only to G-d, it is considered virtually blasphemous for a free man to act in such a fashion -- a slave, on the other hand, may perform a task such as this. Interestingly, if a Jew is wearing tefillin he may certainly engage in such a task. A Jew in tefillin may tie his teacher's shoe since the fact that he is wearing tefillin displays that he is a free man. It is clear that he is merely helping his fellow Jew and not enslaving himself. By removing his teflillin before Shlomo HaMelech, Yeravam was saying, "While in tefillin I can do anything for you, but I am taking them off, because I don't want to serve you. I don't want you to rule over me; therefore I am limiting the actions that I am allowed to take on your behalf." This indeed is a rejection of the King. This is outright demand for freedom from Shlomo's rule – and Yeravam had to flee on account of his rebelliousness. So, here we see the connection between tefillin straps and shoe straps. 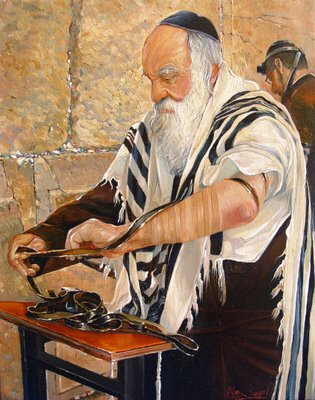 Just as a widow is able to go from a state of restriction in her choice of marriage partners to total freedom of choice through the straps of chalitza, Avraham Avinu was able to go from subservience to money to total independence of man by not accepting the booty from the King of Sodom and thus merit the straps of tefillin. And so it is for us: We can often become easily enslaved to our budget and make decisions primarily based on financial grounds. These precious days of Elul, however, are an appropriate time for us to remember that we are free people and that with our decisions we should place Hashem at the forefront. Excellent post (as is Neil's) - very nicely tied together. I will have an extra appreciation for my teffilin on Sunday...thanks!